On the day in January 2013 that Eric Swalwell was sworn-in as the East Bay's new congressman from the 15th District, he was interviewed on Politico TV, one of his first appearances as the talking head millions of American now view daily on cable news. The hosts ended their interview with a cheeky question. "I want to be the first person to ask you this — I hope I am — are you ever going to run for president of the United States?" The reporter then chuckled, as someone in the studio cackled faintly. Even Swalwell seemed amused. "I appreciate you asking," he said. "About 14 months ago, no one ever thought I would run Congress. In fact my own parents thought I was crazy and tried to talk me out of it. I'm just thrilled to be here." C-SPAN commentators also asked Swalwell the question later the same day. Perhaps it was the way the former prosecutor and city councilman carried himself — young, fit, brash, and determined — which prompted the question in the reporter's mind. Their instincts were indeed correct. In the next few weeks, Swalwell, 38, is expected to announce a run for president, becoming the second Democrat in the race, along with Sen. Kamala Harris, with strong ties to the East Bay. 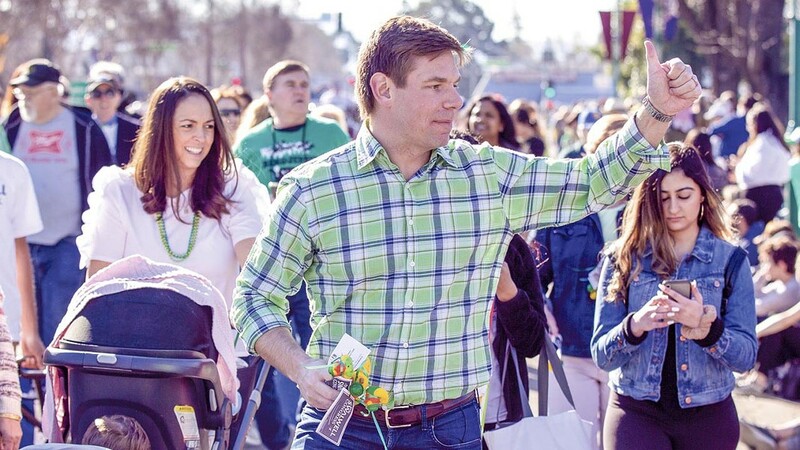 While the trajectory of Swalwell's rise is almost unmatched in recent Bay Area political history, most members of the political and media chattering classes seem to view the young congressman's presidential ambitions as a sign of hubris that is doomed to fail. After all, no one has ever become president having served their nation in no higher an office that of a member of Congress. Maybe he's really angling for the U.S. Senate one day? A cabinet seat in a future Democratic administration, perhaps? Vice-president? Swalwell has heard it all before. The political cognoscenti in East Bay said he was crazy to challenge a 40-year congressman after less than a year of experience on the sleepy Dublin City Council. Yet he proved them wildly wrong. In years leading UP to Swalwell's stunning upset of Pete Stark in 2012, the presumptive presidential candidate often veered toward the political center, sometimes even courting conservatives, in order to advance his political career. This strategy initially bred great skepticism among progressives, labor unions, and Stark loyalists, who viewed him too moderate for the East Bay district that runs from the Tri-Valley to Hayward and most of Fremont. But after vanquishing another long-time East Bay progressive in 2014, those doubts subsided greatly. Along the way, Swalwell's visibility in Congress has blossomed, foreshadowing his rapid rise as one of the nation's most forceful critics of President Trump, through his use of social media and almost daily appearances on cable news. The question now is how might Swalwell's savvy political instincts serve him in a race for the Democratic nomination for the presidency. The man Swalwell replaced in Congress was a legend among East Bay progressives. Like Swalwell, Rep. Pete Stark was a young, energetic man when he coalesced opposition to the Vietnam War to beat a long-time congressman from his own party in 1972. Stark's anti-war streak wasn't just politically expedient, he was a peacenik for his entire stint in Congress. He also was known as the only openly Atheist member of Congress. He focused much of his time on health care issues and is best known for the Stark Law, anti-kickback legislation approved by President George H.W. Bush that prohibited doctors from making patient referrals to offices and clinics of which they or an immediate family members has a financial interest. For his service, Stark was wildly popular in the East Bay and never faced a remotely contested re-election until facing Swalwell. But after the newly formed non-partisan California Redistricting Commission drew new congressional boundaries that took effect in 2012, a larger than expected chunk of the new 15th District included parts of the Tri-Valley that Stark had never before represented. Not only were those voters not familiar with Stark, but Eastern Alameda County's many moderate-to-conservative voters weren't necessarily receptive to his very vocal brand of progressivism. Stark's campaign realized early on that the redrawn district's new areas could pose a problem. That is, if someone dared to challenge the liberal lion. Local political power structures tend to perpetuate the power of the incumbency. The Alameda County Democratic Party is no different. While speculation about Stark possibly retiring was heard in years prior to the 2012 election, no candidate came close to entering the fray. Yet the runup to the 2012 election was different. State Senate Majority Leader Ellen Corbett, someone often viewed as Stark's most likely successor if he were to retire, was making noise about possibly running for Congress. Ro Khanna was also cozying up to Stark and was even begin to raise money for such as campaign. But county party officials intervened to stop the potential insurrection. Corbett and Khanna met privately to gauge each other's intentions and create a contingency plan in case Stark called it quits. Corbett ultimately relented to the pressure and dropped her plans for Congress. Khanna later set his sights on the seat held by Rep. Mike Honda, another long-time progressive in the neighboring 17th District. Swalwell, on the other hand, saw opportunity in the reshuffled new congressional district, even though it meant that he would have to buck an intransigent local party that was beholden to the past and unable to see the future. The would-be challenger also recognized that Stark did not live full-time in the district, favoring his home in Maryland. The incumbent also was clearly showing his age, moreso physically than mentally. And while Stark's mean-spirited jibes such as his biting remarks about George W. Bush "getting off" by having soldiers killed in Afghanistan were wildly popular to his progressive base, Swalwell knew that they wouldn't play the same way to Tri-Valley voters.